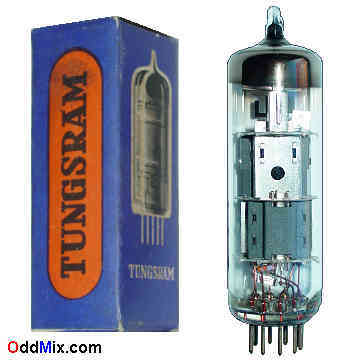 This is an original Tungsram PCL86 Medium-Mu Triode Sharp-Cutoff Pentode electron tube. Good subtitute - except for the filament voltage - are the ECL86. The tube designed for audio service for TV [television] and FM receivers. A Low-Mu triode can be used for many other special purpose circuits like oscillators and RF amplifiers. This compound tube has an ECC83 like single triode and an EL84 like output amplifier thus it is exceedingly useful for a single channel audio or guitar amplifier. Also excellent for antique radio or television restoration, radio amateur projects or to set up a private vacuum tube museum. It is a NOS tube - New Old Stock, unused, excellent condition.